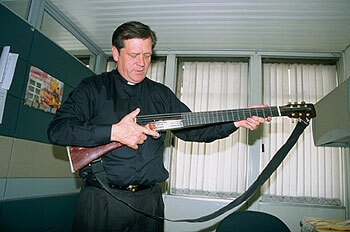 Father Alírio’s “guitar-rifle”: transforming weapons into artwork. Photo courtesy of Vinicius Souza. In São Paulo, you have only to turn on the TV in the afternoon to get the feeling that we are going through a civil war. Stories of cops versus bad guys, shootings, muggings, robberies, drug dealing, rebellions, horrid crimes and lots of blood don’t take long to redden the screen. The comparisons of that state of things with nations that are fighting real wars, like neighboring Colombia, where guerrillas and paramilitary groups have been struggling to win power since the 1960’s, are not unusual. There is no doubt that the violence and death rates are still extremely high in these two countries; however, both in Brazil and in Colombia, some good news is beginning to be heard on the matter, thanks to policies of disarmament and smart and coordinated strategies that integrate police, government and society. Trouble is that the victories in this war seldom make the headlines. Not that the people of São Paulo live in a safe paradise. After all, the current yearly rate of 36.9 homicides in each group of 100,000 inhabitants is almost four times greater than what would be admissible in any country of the first world. However, the disclosure of the results of important studies performed by Unesco and the Seade Foundation, which produces statistical data for the state of São Paulo, showing the consistent decrease in the number of murders in the state over the last five years, was hardly noticed. Blood and extreme poverty are much more interesting subjects! As a matter of fact, according to the studies there was a 29 percent decrease in the homicide rate from 1999 to 2004. According to the Seade study, the rate in the city of São Paulo for the same period is even more impressive: a 40.6 percent decrease in the homicides. The most surprising data are relative to Jardim Ângela, which was once considered by the United Nations the most violent neighborhood in the world, with an average of two murders per day in 1999. There, the number of homicides decreased by the unbelievable rate of73.3 percent, and on Friday, June 24, the district celebrated its 64th day without the occurrence of a single death. The residents of Jardim Ângela are not so afraid of going out on the streets anymore, and, little by little, they are recovering their self-esteem. Believe it or not, the situation is quite similar to that of the capital of Colombia. And in the good sense! In 1994, there were 4,457 homicides in Bogotá, representing a rate of 80 deaths in each group of 100,000 inhabitants (similar to Rio de Janeiro, which had a rate of 73.6 / 100,000 last year). In 2003, the city recorded 1,607 homicides, or approximately 23.4 / 100,000 — a 48 percent decrease in ten years. Bogotá is a less violent city than São Paulo. You may be wondering how those two cities attained such achievement. The answer begins by the population’s disarmament. “It’s a solution that doesn’t put an end to the conflicts, but makes the confrontations much less lethal,” says Denis Mizne, director of the Sou da Paz (I’m for the Peace) Institute, in São Paulo. The figures seem to prove his theory: in 2004, the state’s Single Health System (SUS — Sistema Único de Saúde) recorded a 7 percent decrease in the number of hospitalizations due to bullet wounds compared to 2003. According to Mizne, this rate is directly associated to the submission of 110,535 weapons to the federal police in the period comprised between July 15, 2004, and June1, 2005, for the official campaign of disarmament — not to mention the 3,550 weapons collected by the Sou da Paz campaign since 1997. There are no specific figures for the city of São Paulo. In Bogotá, we can make the same analogy: following a disarmament campaign performed in 1996 by the city, which collected 2,566 weapons, 350 grenades, seven dynamite sticks and even an Israeli-manufactured landmine, there was an immediate decrease in the number of homicides by firearms — 31.36 percent in December 1996, compared to the same month in 1995. In face of such a success, other “civic parades for the disarmament” have been performed by the Catholic Church and the government in1998/1999, 2001 to 2003, and again in 2004, and they are ongoing this year. Between the first few months of 2000 and the same period of 2003, a 5.3 percent decrease was detected in the homicide rate. “We apply here a campaign method similar to the one performed in New York, exchanging the weapons and ammunitions by bonuses which can be converted in food, clothes or books,” explains Father Alírio López Aguilera, director of the Program for the Sacred Life and Disarmament of the Bogotá Government Secretary. “We believe this method is better than paying in cash for the weapons, for this way the money won’t be used to buy alcoholic drinks or cigarettes.” Each homemade shotgun is worth approximately$16, while manufactured weapons are exchanged by bonuses which are equivalent to approximately $80 in goods. During the campaigns, toy guns may also be exchanged for coloring books, crayons and candy bars. The weapons which are not destroyed are transformed into “works of art” and “musical instruments” which ornament the walls of Father Aguilera’s office. The third issue which has to be dealt with is the association of alcohol with weapons. According to data issued by the public security secretary of São Paulo, less than 5 percent of the deaths are due to armed robbery, a rate similar to that of shootings with the police. “It means that the majority of the homicides results from bad guys killing bad guys or good guys killing good guys,” says the Sou da Paz director. It is estimated that approximately 60 percent of the murders in Brazil occur by futile reasons. The huge majority includes pub fights and altercations between drivers in traffic, members of the same family or neighbors. Those data have encouraged experiences of closing the bars at 10:00 p.m. in the city of Diadema, in Great São Paulo, where the homicide rate decreased from 75.91 / 100,000 inhabitants in 2000 to 34.58 in 2004. According to the Sou da Paz director, there is no possible solution without the real integration of the organized civil society. In Jardim Ângela, for example, 26 nongovernmental organizations develop a great number of activities which aim at social inclusion. The most important are the projects focused on the youngsters in situation of risk, which offer them professional formation, income generation and artistic development as feasible alternatives to a career in crime and drug dealing. In Ciudad Bolivar, the most violent neighborhood in Bogotá, nongovernmental organizations like the Justice and Life Project guarantee the enrollment and permanence of poor children in the public schools, linking them to the participation of the mothers in courses of citizenship and human rights. View the Worldpress Desk’s profile for Maria Eugênia Sá.View the Worldpress Desk’s profile for Vinicius Souza.